Beside participation on a exercise radionet (see fig. 2) the radiotelegraphist was tout about the radio WS-22 by English instructors. The Signal unit was transferred to Semarang together with the rest of the Brigade on 9th March 1946 and was stationed in the district Tjandi. Directly after their arrival the small unit was filled with personel so by the end of the year it was up on the strength of KNIL personel, which it was supposed to. Leader of the unit was on the paper a vdg. Koot from the Army. He cannot have had much influence on the daily work of the unit. Most of it went on in the subunits which was lead by sgt. Scheffer and Kruk. At a later day it was said that the unit was lead by a Capt. Flucks from the Army. The radio platoon was reinforced with among others the Surinamian sergeant Terlingen, Corporals Pingoen and Smit together with soldier 1st class Oroh. To their disposal they had the following radioes SCR-399, WS-19 HP/CV, WS-19/jeep and a few WS-22. First the permanent installions was set up as shown in figure 24. First the WS-22 was used for this purpose but later it was the WS-19. In the clearingsoperations which followed the Communication unit was called on for (early) mobile connexions. First they tried to use the radioes WS-18 and WS-48 but they functioned in no way. Then they tried with the WS-22 made portable in bags and on carriers. It continued to be difficult for use in the terrain by the personel in the Infantry which it had to follow until used could be done of prisoners of war. Later on a construction to carry it on horses would be made on the initiativ of Capt. Flucks. This did not function either since the horses got upset when walking near obstacles and damaged the apperatures. When they came to a rice field the animal and apperature sank deep in the mude. Then with a loty of difficulties the personel had to try to drag them up again. This made an end to making the radio WS-22 mobile unless in a vehicle. The Telephone platoon was put upto strength too. They had to their disposal the telephoneapperatures Tele L, Tele F and EE-8, the centrals UC-6, UC-10, F&F, BD-96 and the linegear RL-31, RL-39, DR-4, DR-8 and Quad-cable. The telephoneconnexion was put together as shown in fig. 24 af the radioconnexions functioned. The centrals on the Batalioncommandstations where original of the type UC-6 and UC-10. In the end of December 1946 the Signal unit was reinforced by the Army. For the radio platoon it meant an extra burden since sergeant Scheffer and soldier Kramer had to divide their time between their original work and the training of new radio operators. During the 1st Police Action the T-Brigade got the task to brake out in a W, S and E direction with as end goal Weléri, Salatiga and Demak. 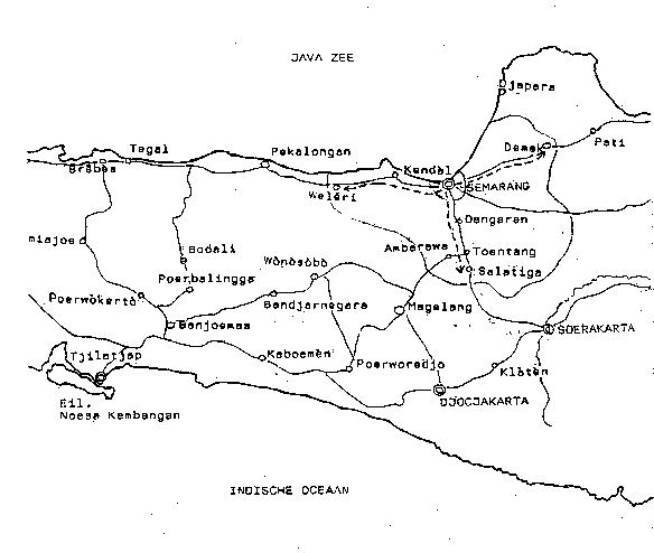 Semarang itself was taken over by a Territorial Command with 4 batalions. The primary attack went in a southern direction and it was here the Signal unit was concentrated. It is most certain they where reinforced with personel among others soldier L. Schram. During the advance the radiocombinations WS-19 HP/CV and WS-19 HP/jeep was put to use as shown in fig. 25. About the results it is known that they where not good enough; This is not strange since barantennes, groundwaves and high mountains was asking for problems. About the radioconnexions in the final fase it is only known that they looked as shown in fig. 25. First the Telephone platoon laid a line of Quad-cable from Semarang to Salatiga. Here a military central was installed of the type BD-96. Then lines where laid to the different units of the Brigade in the region. It is estimated that it at least was made to the three Battalion command posts as shown in fig. 25. The line of Quad-cable later replaced by a line running from the PTT central in Semarang to the PTT central in Salatiga. Originally this was made possible by the cooperation between the Signal unit of the B-Division and the Signal unit of the T-Brigade working towards each other from respectively Semarang and Salatiga. After the 1st Police Action the Headquarter of the T-Brigade was moved to Salatiga. From then on they only operated in this area. The connexions as shown in fig. 25 continued with the change that the telephone connexion from Semarang was not connected directly to the central of the T-Brigade but through the PTT central in Salatiga.